While short on sophistication, this mailbox alert system might work well in some simple environments. Update 01-23-19: Since we published this review, the team behind Smart Alert For Mail (SAM) reached out to make the point that its product range will vary depending on the number of obstacles and types of obstacles between the SAM transmitter and receiver. In fact, they now state “typical range is around 150 feet in most installations” in their Amazon listing. Moreover, they pointed out that pairing issues can be resolved by trying a different smart device first, and emphasized that customers can return Smart Alert For Mail if they’re not satisfied with the transmitter range. TechHive stands by its review, but nonetheless wanted to relay the product team’s message. 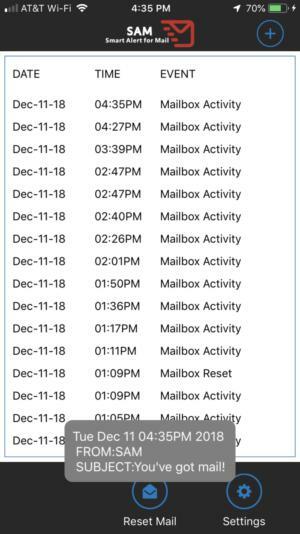 The creator of Smart Alert for Mail obviously had a problem that no one else had been able to solve: Knowing when their mail had arrived. Enter Smart Alert for Mail—aka SAM—a gadget with a singular purpose, one which you’ve already figured out after reading this far. SAM comes in two pieces, a transmitter that fits in your mailbox and a receiver that sits inside your house. 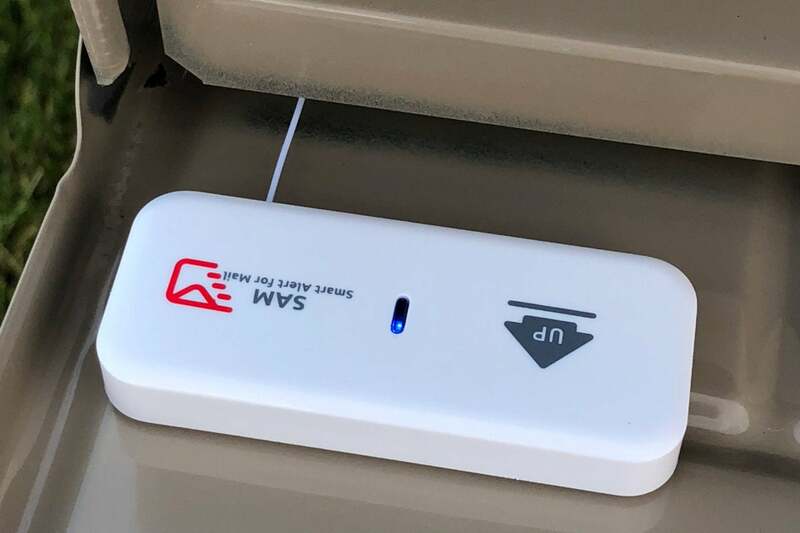 The transmitter attaches via sticky tape and Velcro to the inside of your mailbox (a small antenna wire snakes out through the gap in the door), while the receiver goes anywhere inside your house that’s in range of a power outlet (and as close to the transmitter as possible). The transmitter communicates via the unlicensed 433.92MHz frequency band, which gives it 300 feet of range in unobstructed, open air. The transmitter’s small antenna must be routed outside the mailbox, so its low-power radio signal isn’t blocked by the walls of the mailbox. As a completely optional step, you can connect SAM to your smart phone via Wi-Fi and SAM’s basic app. This alerts your phone as well when mail arrives, and it also keeps a log of when your mail was delivered each day, should that information be important to you. Alas, there are no hooks to other smart home gear, so you can’t flash your Philips Hue bulbs or have Alexa announce your letter carrier’s arrival. While the basic operation of SAM works as expected, I did experience a few major problems that will prevent me from using it regularly going forward. With SAM, you need never guess if there’s mail in your mailbox. The primary issue is range. While SAM claims 300 feet of range in an outdoor, unobstructed environment, unless you live in a tent in an open field, this isn’t realistic, and the company notes that its expected range drops to 120 feet if a single wall is between you and your mailbox. In my environment, which had a single window (but no wall) and some foliage between the transmitter and receiver, I was able to achieve about 150 feet of range. 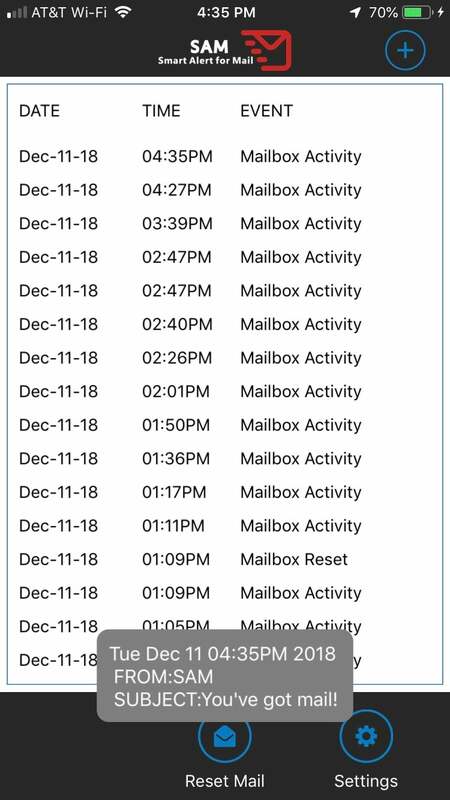 With my mailbox about 220 feet away (as close as I could get the receiver to it), this turned out to be a problem that essentially blocked my ability to realistically use the product at all. I also encountered serious trouble getting SAM’s app to work. The configuration instructions could use some rewriting, but even when followed closely I was never able to get my iPhone to connect to SAM’s temporary Wi-Fi network, a step required to connect it to my own wireless router. The system simply kept timing out before I could complete the connection. After nearly an hour of failed attempts, I finally resorted to a workaround: I installed SAM’s app on my iPad, configured it there successfully, and then shared the device with my iPhone through a function available in the app. Once this was done, I was able to receive mail alerts on my phone, which are set as push notifications by default. The range issue is the bigger of the two here, as SAM is a product best suited for people who don’t want to (or can’t) walk to a distant mailbox several times each day to see if their mail has arrived. If your mailbox is close enough, SAM’s utility is limited. For users with mobility impairments or other restrictions that prevent them from checking a mailbox that’s nearby, the product could nonetheless merit consideration. 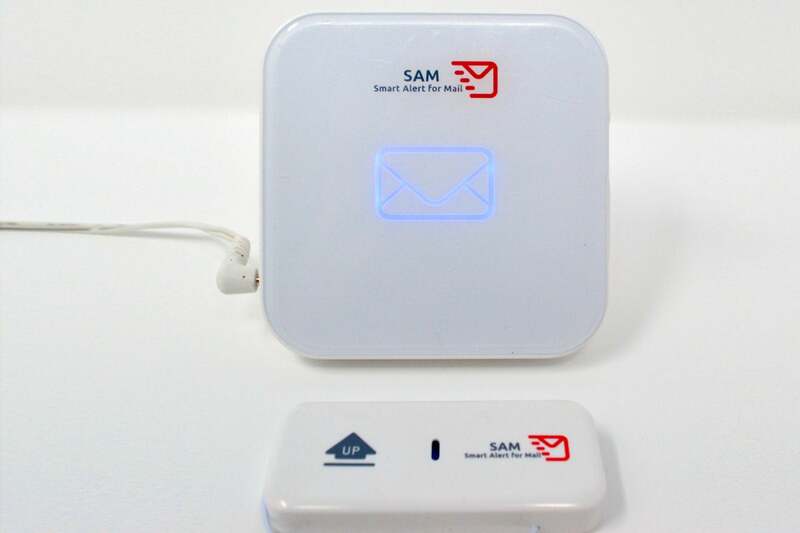 This story, "Smart Alert for Mail (SAM) review: How to check your mailbox without leaving the house" was originally published by TechHive. This simplistic gadget alerts you when the mailman comes, but only if your mailbox is close enough to your house.